Think you have this fitness thing figured out? Think again! The Ripped Dude has brought together three more incredible fitness athletes to offer sound advice about losing weight, shedding fat, and staying lean. Put your seatbelt on—let's go for a ride! Follow this advice, and in no time, that belt will feel looser than it does now. What do you do to increase your metabolism? The Hammer is certified to the gills. If you have a fitness goal, he can help you get there. He is not only shredded, but his drive and personality have made him one great coach. Amer Kamra: Speeding up your metabolism comes from being consistent. 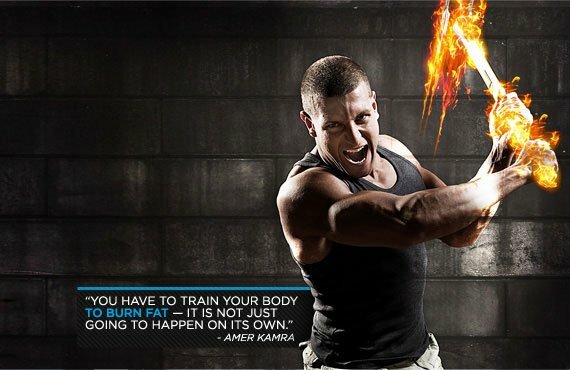 You have to train your body to burn fat—it is not just going to happen on its own. Maintaining a clean diet and training with intensity for a few weeks at the bare minimum will help to rev your metabolism. I have found over the years that training hard and intense, with short rests between sets, also increases my metabolism. I use coconut oil or MCT oil for my fat source. I do HIIT sessions several days per week. If I'm not trying to peak for a shoot, I'll have a cheat meal. Protein is a must at every meal. Aside from my structured workouts, I try to be as active as possible during the day. I don't sit much. Artus Shakur: First, drinking three liters of water per day helps my body function at peak performance levels. Second, I get at least seven to eight hours of sleep every night. Sleep is crucial to a healthy metabolism. Anything less can adversely affect your body's ability to burn calories. Third, I've been doing cardio exercises in the cold because newly-published research indicates that cold helps brown fat work at maximum capacity. Brown fat helps efficiently burn the white fat in your body. And last, I drink two cups of Kombucha Tea every day. Its detoxifying properties may help my body function at optimal levels. How many meals you eat per day? How does your meal plan help you stay lean? Amy Jo is a trainer, fitness competitor, nutritionist, model and a mother. She's graced the cover of Muscle & Fitness and made a name for herself as a spokesperson for the fitness industry. Amer: The amount of meals does not matter to me. I usually just aim to hit a specific caloric intake. At the end of the day, it doesn't matter if you eat two meals or five meals that equal out to 3,000 calories. The amount of meals I consume is based upon my schedule. Regardless of how many I eat, all meals consist of the same healthy foods. Amy Jo: I've eaten five meals per day for years. I'm not opposed to the three-meal-per-day plan because I've read that eating fewer meals can, among other things, help prevent our pancreas from overworking. Since I'm pretty active throughout the day, the five meals seem to keep my blood sugar stable and my energy up. Also, because of this habit, my stomach growls after two or three hours! Artus: I eat eight meals per day. Consistent, small portions keep my metabolism high. Not providing my body enough food is a surefire way to slow down its basic functions. What's your cardio schedule? How does it help you stay ripped? Amer: I like to perform cardio at least 5 days per week to stay healthy and maintain a lower body-fat percentage. I cycle my cardio sessions: performing one day of moderate intensity on the Stairmaster followed by a day of high intensity heart-rate training (a form of HIIT). My HIIT days are only 10-20 minutes long, but they're intense. Amy Jo: I love HIIT training. I do plyos or sprints four or five days per week for about 45 minutes. I also do one or two days of steady-state cardio for 60-90 minutes. Artus Shakur: I do 30 minutes of cardio before I train five times per week. Do you follow a set macronutrient ratio? This may change as circumstances dictate, however. My theory is that you must be instinctive and listen to your body. If some days I feel as though I don't need as many carbohydrates, I will reduce them. The key is to listen to signals your body provides, but you also need to be honest with yourself. Give your body what it needs, not what your mind wants. Amy Jo: 40-30-30 is usually best for me. Artus: 35-50-15 works for me. I eat 180 grams of carbs per day, which equal 1,068 calories; I also get 300 grams of protein each day, 1,202 calories; my fat comes in 45 grams, or 400 calories. Many people seem to over-train. How many days off do you give yourself and why? Born in Istanbul, Turkey, Artus started out as a professional soccer player. After a devastating knee injury, he turned to fitness. Now he's a fitness model and personal trainer. Amer: As of now, I'm not trying to gain size. So, I don't rest as often as I would recommend to somebody trying to gain lean muscle mass. I train four days with weights, then I take a day off. But, even on my off days I do something active like play basketball or rock-climb. For somebody looking to gain lean muscle mass, I would recommend three days of work and one day of rest. Also, it's important to note that overtraining sometimes results from underfeeding. That is why consuming an adequate amount of healthy foods and supplementation is key for recovery and growth. Amy Jo: I take one day off per week. I think rest days depend on the individual and the individual's current goals. I need a day off more for my mental state than my physical. Sometimes you just need to stay in your pajamas all day. Artus Shakur: I train 5 days per week: That's 5 hours of weight training and 2.5 hours of cardio for a total of 7.5 hours of training per week. I do this to keep my bones and muscles strong as well as to stay lean all year. What is a normal daily diet for you? Amer: As I mentioned, I manipulate my meals based on how I feel. Below is a sample nutrition plan for an average, moderate carb day. I do not consume processed foods or anything with added ingredients, they are all foods that contain only one ingredient. Amy Jo: Usually, I'll eat oat bran and eggs for breakfast. I'll have a fat source, a protein shake, and some berries for my second meal. For lunch I'll have some sort of protein, salad, and brown rice, and then another protein shake and fat for my fourth meal. For dinner I eat salmon and veggies. Do you eat cheat meals? If you do, how many do you have per week? Amer: In the past, I would only consume re-feed meals that replenished my body of what had been diminished. Usually, the meal had a large, clean meal of carbohydrates that were moderate or high on the glycemic index, fats, and sodium. More recently, I have been using a half-day cheat once per week. After my morning workout, I pretty much eat whatever I want until about noon. This has kept me leaner, harder, and fuller. So I think I'll keep doing it. Amy Jo: Yes I do! I usually have one per week unless I'm trying to peak for a job or a shoot. Artus Shakur: I eat a cheat meal once per week. My favorite cheat meal is sushi.